If you’re looking for a special, unique piece of jewellery come and see us. We have one of Norwich’s widest selections of pre-owned and antique jewellery, including wonderful diamond and gem set pieces. We also stock a large range of new and contemporary jewellery. We are particularly busy selling engagement rings from our Norwich shop and have a beautiful selection. And we offer a bespoke wedding band service and a good secondhand range. See a small selection of our stock below. 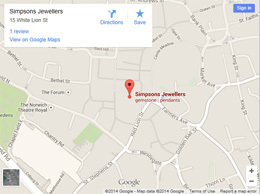 Why not pop into our store on White Lion Street, Norwich to take a look for yourself? If you have a particular requirement, please email or call us on 01603 767786 and we will be happy to let you know if we have something suitable and email you some pictures. Cash for Gold in Norwich We'll pay you a top price, instantly, for your scrap Gold.